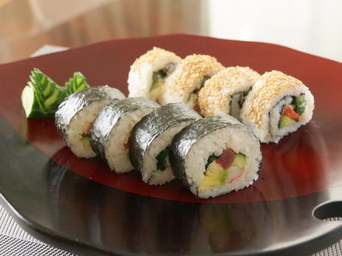 Sushi parties are available for this course. For details, please see this page. In this course we will be using salmon, tuna, crab sticks for the sushi filling and bonito flakes for the soup stock. If you cannot eat raw fish, smoked salmon and boiled shrimps can be used instead. In this course we will be using kombu kelp and dried shiitake mushrooms for the soup stock. Course Fee : 7,500 yen per person. 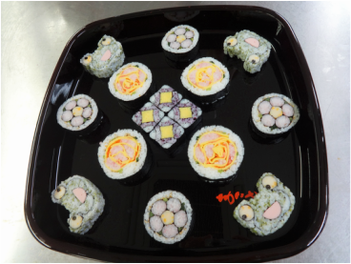 This course will teach you how to make 2 types of decoration sushi. 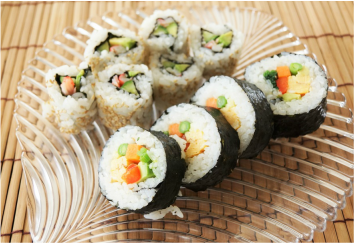 Course includes how to make sushi rice, Served with dessert and tea or coffee. Minimum participants :2, Maximum Participants 6. In this course we will be using cheese and pork sausages. pork sausages can be changed to eggs or fish sausages. We will be making frog sushi and flower sushi.